In this example, we extend our LCDRange class to include a text label. We also provide something to shoot at. t12/lcdrange.h contains the LCDRange class definition. t12/lcdrange.cpp contains the LCDRange implementation. t12/cannon.h contains the CannonField class definition. t12/cannon.cpp contains the CannonField implementation. t12/main.cpp contains MyWidget and main. The LCDRange now has a text label. We name declare QLabel because we want to use a pointer to it in the class definition. We have added a new constructor that sets the label text in addition to the parent and name. This function returns the label text. This slot sets the label text. Because we now have two constructors, we have chosen to put the common initialization in the private init() function. We also have a new private variable: a QLabel. QLabel is one of Qt's standard widgets and can show a text or a pixmap with or without a frame. Here we include the QLabel class definition. This constructor calls the init() function, which contains the common initialization code. This constructor first calls init() and then sets the label text. The setup of lcd and slider is the same as in the previous chapter. Next we create a QLabel and tell it to align the contents centered (both vertically and horizontally). The connect() statements have also been taken from the previous chapter. This function sets the label text. The CannonField now has two new signals: hit() and missed(). In addition it contains a target. This slot creates a target at a new position. The hit() signal is emitted when a shot hits the target. The missed() signal is emitted when the shot moves beyond the right or bottom edge of the widget (i.e., it is certain that it has not and will not hit the target). This private function paints the target. This private function returns the enclosing rectangle of the target. This private variable contains the center point of the target. We include the QDate, QTime, and QDateTime class definitions. We include the stdlib library because we need the rand() function. This line has been added to the constructor. It creates a "random" position for the target. In fact, the newTarget() function will try to paint the target. Because we are in a constructor, the CannonField widget is invisible. Qt guarantees that no harm is done when calling repaint() on a hidden widget. This private function creates a target center point at a new "random" position. We use the rand() function to fetch random integers. The rand() function normally returns the same series of numbers each time you run a program. This would make the target appear at the same position every time. To avoid this, we must set a random seed the first time this function is called. The random seed must also be random in order to avoid equal random number series. The solution is to use the number of seconds that have passed since midnight as a pseudo-random value. First we create a static bool local variable. A static variable like this one is guaranteed to keep its value between calls to the function. The if test will succeed only the first time this function is called because we set first_time to FALSE inside the if block. Then we create the QTime object midnight, which represents the time 00:00:00. Next we fetch the number of seconds from midnight until now and use it as a random seed. See the documentation for QDate, QTime, and QDateTime for more information. Finally we calculate the target's center point. We keep it within the rectangle (x=200, y=35, width=190, height=255), (i.e., the possible x and y values are x = 200..389 and y = 35..289) in a coordinate system where we put y position 0 at the bottom edge of the widget and let y values increase upwards X is as normal, with 0 at the left edge and with x values increasing to the right. By experimentation we have found this to always be in reach of the shot. Note that rand() returns a random integer >= 0. This part of the timer event has not changed from the previous chapter. This if statement checks whether the shot rectangle intersects the target rectangle. If it does, the shot has hit the target (ouch!). We stop the shoot timer and emit the hit() signal to tell the outside world that a target was destroyed, and return. Note that we could have created a new target on the spot, but because the CannonField is a component we leave such decisions to the user of the component. This if statement is the same as in the previous chapter, except that it now emits the missed() signal to tell the outside world about the failure. And the rest of the function is as before. These two lines make sure that the target is also painted when necessary. This private function paints the target; a rectangle filled with red and with a black outline. This private function returns the enclosing rectangle of the target. Remember from newTarget() that the target point uses y coordinate 0 at the bottom of the widget. We calculate the point in widget coordinates before we call QRect::moveCenter(). The reason we have chosen this coordinate mapping is to fix the distance between the target and the bottom of the widget. Remember that the widget can be resized by the user or the program at any time. There are no new members in the MyWidget class, but we have slightly changed the constructor to set the new LCDRange text labels. We set the angle text label to "ANGLE". We set the force text label to "FORCE". The LCDRange widgets look a bit strange - the built-in layout management in QVBox gives the labels too much space and the rest not enough. We'll fix that in the next chapter. 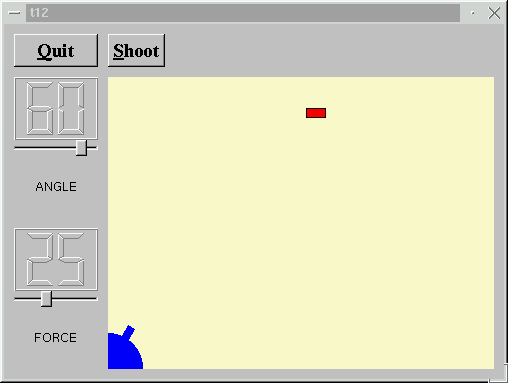 Make a cheat button that, when pressed, makes the CannonField display the shot trajectory for five seconds. If you did the "round shot" exercise from the previous chapter, try changing the shotRect() to a shotRegion() that returns a QRegion so you can have really accurate collision detection. Make sure that the target is always created entirely on-screen. Make sure that the widget cannot be resized so that the target isn't visible. Hint: QWidget::setMinimumSize() is your friend. Not easy; make it possible to have several shots in the air at the same time. Hint: make a Shot object. You're now ready for Chapter 13.